Explain how eddy currents are used in NDT. Explain why NDT is so important to our society. Nondestructive testing (NDT) means exactly what the words say. NDT literally means testing materials without destroying them. In other words, we can look for defects in a variety of metallic materials using eddy currents and never harm the material that we are testing. This is important because if we destroy the material we are testing, it does not do much good to test it in the first place. NDT is very important because often the defects that we are looking for are not visible because paint or some other coating may cover them. There might also be defects that are so small they cannot be seen with our eyes or any other visual method of inspection. Therefore, inspection methods such as eddy current inspection have been developed to detect the defects. In the experiment below you will use eddy current testing to detect cracks in a block of metal. You will notice that you are using a coil of wire wrapped around a piece of iron to generate the magnetic field that caused the eddy currents to form in the metal. In the field of NDT the coil is called the inspection probe. The magnetic field that is generated by the eddy currents can be detected using this same probe. We can monitor the magnetic field being produced by these eddy currents with an instrument called an eddyscope. If there is a change in the magnetic field from the eddy currents, we can tell that we have found some sort of defect in the material that we are testing. When the instrument sees a change in the magnetic field generated by the eddy currents, it displays a change in the signal on the screen. As long as the material being tested is very uniform in every way, the eddy currents will be uniform and consistent. If there is some defect in the material such as a crack, the eddy currents will be disturbed from their normal circular shapes. NDT technicians use many different types of eddy current testing equipment. Some are simple coils that are held on a piece of metal. Others use special probes, like the one shown above, that are pushed inside of tube such as those in heat exchanger units. 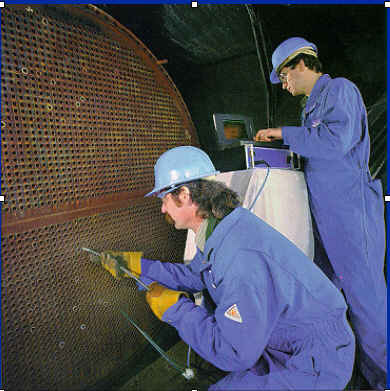 The technicians on the right are performing an eddy current inspection on the tube of a heat exchanger. Heat exchangers are used in places like nuclear power plants. Radioactive water from the reactor is circulated through the tubes and cooling water that will be returned to a river or lake is circulated on the outside of the tubes. It is very important that the radioactive water and the cooling water do not mix. Therefore, technicians perform eddy current inspections on the tubes to find and defects that may be present before they become leaks in the tubing. NDT stands for "Nondestructive Testing." NDT methods are used to test materials and parts without harming them. Eddy current testing is just one of the methods used by technicians to find defects before they cause problems.